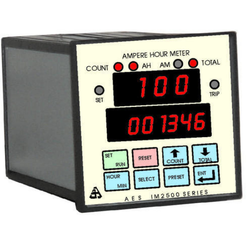 We offer IM2502 Ampere Hour or Minute Meter which is an advanced model of IM2501. Besides, from the basic regular counting of ampere-hour/minute or seconds, this one comes with totalizer. The totalizers are vital for all electroplating usages as this one manages the concentration of bath and also take care that over of additions of a chemical. In an addition to the features of IM2501 like preset setting and relay output are integrating into this one as well. Moreover, there is an additional counter for total AH (ampere hour) or AM (ampere minutes) flowing through the circuit. Looking for Data Acquisition System / Logger Software ?